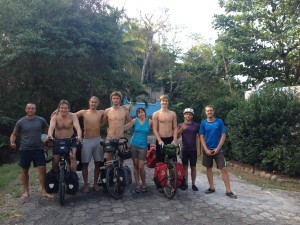 From Antigua, Eugene and Sam left a day earlier to El Salvador. 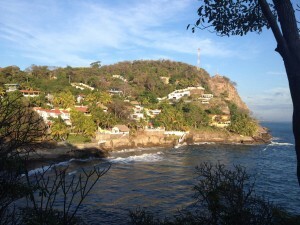 I spent an extra day in Antigua mostly wandering around. The next day was a good start; losing an altitude of 1500 metres over 30 kilometres was not hard. Although, a wrong turn at the end of this costed me a 22 Km’s detour. As I lost altitude, the temperature soared. 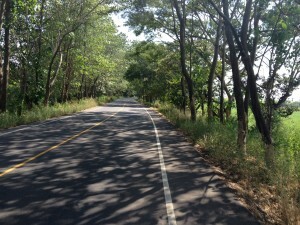 However, riding under the tree canopy provided a lovely respite from the sun. 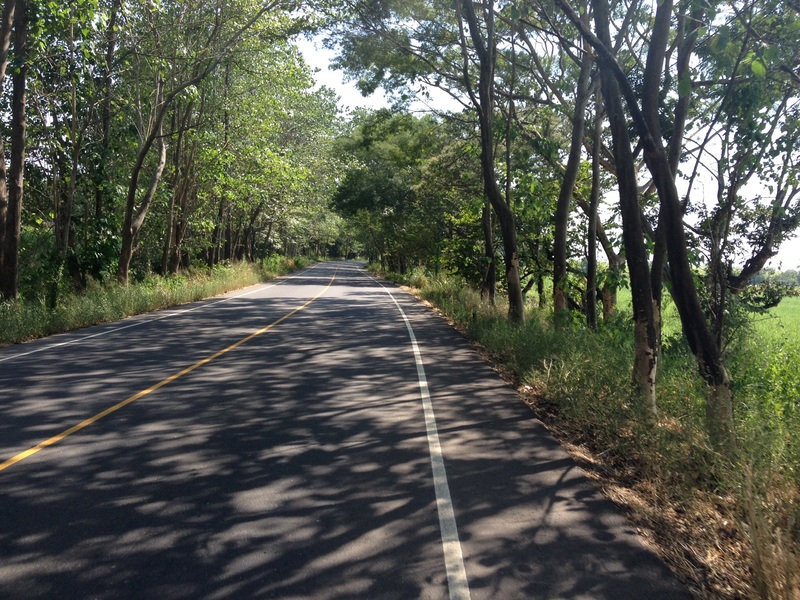 Once on the coast, the road was mostly flat to Guazacapan a 115 Km’s ride for the day. The next day, 20th December, I crossed into El Salvador. 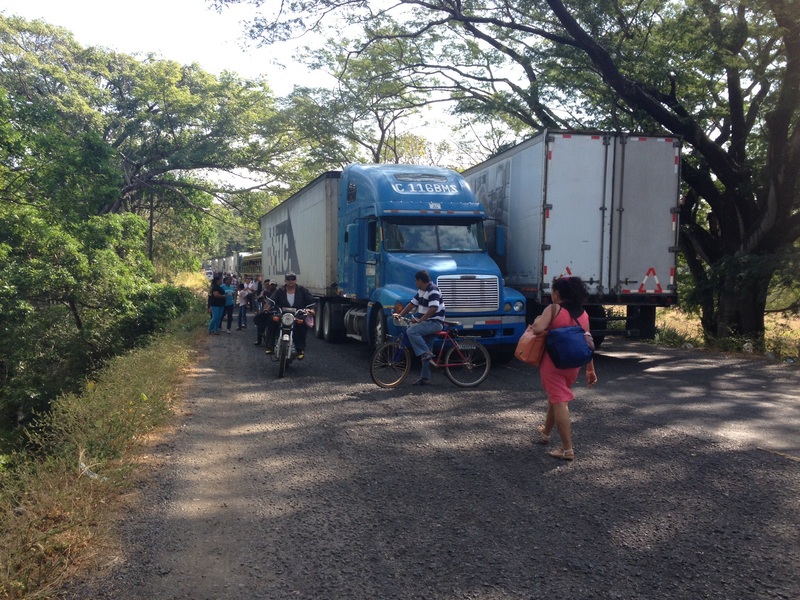 There was a long queue of trucks, approximately 6 Km’s that were waiting for the customs at the border. However, foot passengers, cyclists and smaller vehicles did not have much of a problem. I probably spent less than two minutes at each counter, both Gautemalan and El Salvador immigration offices. A total of 97 Km’s for the day but it was mostly flat; a pleasant ride. 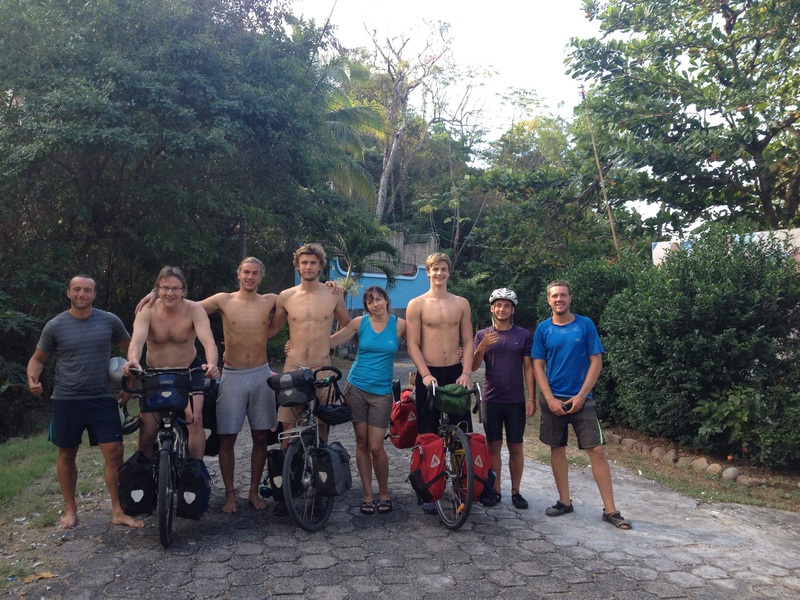 The third day was about 75 Km’s to the resort where Eugene’s family were waiting for me. On the road, I was joined by two more French cyclists whom we have met before. 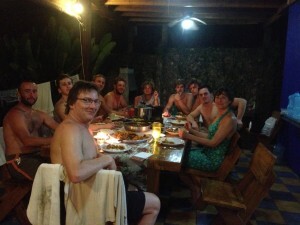 We were 11 of us in total including Eugene’s friends, family and the cyclists, at the holiday accommodation. This cottage was in a lovely place, near La Libertad, El Salvador, including a swimming pool and plenty of trees and a big open area and on top of this it was less than 5 minutes walk to the beach; luxury does not come any better. We were 9 of us with lots of energy. The team spirit pulled me into playing games that I have never played before; football and rugby. I even tried bodyboardong in the sea. Eugene and I had been planning curry for christmas for sometime and have requested his parents to bring some spices including the ones that Jeyatha had sent for us. Curry for Christmas under the hot sun for the Canadians; no, the climate change has not gotten that far, not yet perhaps. The house smelled like Pondicherry during its colonial times, although the French treated everyone equal this time! With the help of the team, I prepared a big curry for Christmas eve. The quantities of ingredients we used is a hint to the amount of curry prepared and consumed: 25 onions, 15 tomatoes, 6 garlic bulbs, 20 eggs. In addition, Eugene’s parents brought 10 kgs of basmati rice from Canada, of which almost 6 Kgs was consumed over three meals. The Christmas eve was spent eating and playing cards until midnight, followed by several board games that were carefully designed to consume fluids which generally makes one laugh and dehydrate. Be a Roman when you are in Rome, I took the full plunge since I was not going to resume cycling for a few days. I had festive times on the road in the past during my previous travels, but this one was exceptional. Momsie and Popsie (Eugene’s parents) were young at heart and we had lots in common from, science to philosophy and life in general. I don’t think this was a chance meeting, perhaps the subconscious has its own ways to bring like minded together. We all ate, played, laughed and relaxed as one big family. It was a happy christmas, a very happy christmas indeed. Many thanks to the Gendron-de Vette family, I had an amazing time. I now have lots of friends in Quebec without having been there. Bala and luxury in the same sentence 🙂 you deserve it! Awesome Christmas we spent with you and the GdV Family. A special thumbs up for your amazing curry meals ! So glad you had a wonderful Christmas, much different from those spent with us and you playing Father Christmas at our front door! Good luck for the next leg, Bala. Burning a trail from Alaska with your curries! Glad it was festive, and that you finally got to play rugby! Happy new year from Yukon ! Glad to see all is well for you. Happy New year to you too Jerome. It’s 30 plus degree Celsius here in Nicaragua.